Formulated without sulfates, Color Shampoo Cattier to the soft light texture and delicate, gently cleanses your hair colored: it preserves the life and brilliance of color. With Coloured Hair Shampoo Cattier, it will protect and restructure the hair fiber. The action of the Jojoba oil will bring shine and a silky feel to hair. The intensity of color is extended and sublimated, your hair is soft and shiny! 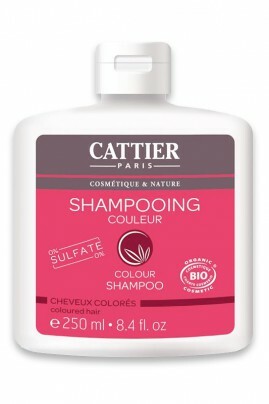 Apply Cattier Shampoo Colored Hair on wet hair, lather on all your hair to distribute from roots to ends. Rinse with warm water. For efficiency, use Conditioner for Coloured Hair Cattier prolong the radiance of your coloring.